"41CE6-13, Burial Feature AN-2" by Timothy K. Perttula and Robert Z. Selden Jr.
DECORATION (INCLUDING MOTIF AND ELEMENTS WHEN APPARENT): The rim has upper and lower horizontal engraved lines with large excised tick marks that either point upwards or downwards. The horizontal lines are divided into four panels by vertical lines that end in upper and lower excised tick marks. 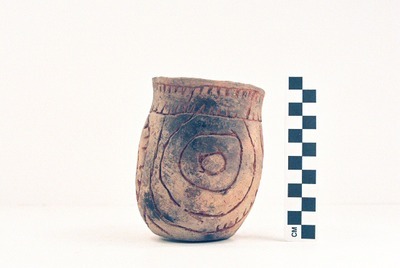 The vessel body has three different concentric circle and semi-circle engraved elements. The first has tick marks on the inner circle; the second has tick marks along the top and sides of the outer semi-circle; and the third has tick marks on a portion of the outer semi-circle. Patton Engraved, var. Freeman or var. Fair vessel from the E. W. Hackney site.